Christian Louboutin collects personal information from its customers and prospective customers mainly to assist in providing premium designer products for fashion conscious individuals by, among other things, processing your order(s), replying to your questions; providing our newsletter, blog and new product updates via e-mail; facilitating a transaction you chose to enter into with our third party partner(s), and incorporating your feedback into improvements to our Website. Placing an order. When you place an order for a product through the Website, you are required to provide contact, billing and credit card information in order to complete the transaction. Contact and billing information from the online order form (name, billing and shipping address, phone number, and e-mail address) is used to process orders and provide you with information about Christian Louboutin. This information, including your e-mail address, is also used to contact you in the event we have questions regarding your order or we need to notify you about the status of your order. The credit card information we collect is used to bill you for products you purchase and, if you provide prior consent, this information also may be shared with a third party partner. Subscribing to newsletters. When you sign up for our newsletter or new products updates, we use your name and the e-mail address you provide to send you the material to which you have subscribed. You may opt-out at any time to any subscription by following the unsubscribe instructions or sending an email to customerservice.ca@us.christianlouboutin.comr with the word UNSUBSCRIBE followed by your email address in the subject of the e-mail message (example: UNSUBSCRIBE youremail@emailaddress.com). Recommending a product to a friend. When you recommend a product to a friend through the Website, we gather your friend’s name and e-mail address. This information is used only once to e-mail your friend to advise him or her about the product you recommend. Responding to an online survey. We occasionally conduct our own online surveys in the course of which we ask visitors for contact information (such as e-mail address) and demographic information (such as zip code, age, and/or income level). With your consent, we use contact information from our surveys to send users information about Christian Louboutin. The demographic information is used to learn more about the types of people who visit the Website. This information currently is not shared with any other parties. We reserve the right to share this information with other parties in the future in an aggregated format that would not disclose any personally identifiable information. As you navigate the Website, certain limited information can and may be collected automatically without your active involvement, using methods known as cookies and navigational data collection. Some of the information (e.g., type of web browser) does not identify who you are. Other information, such as your Internet Protocol (“IP”) address or originating domain, may identify you indirectly, when supplemented with other commercially available sources of information. Christian Louboutin also uses tracking technologies to gather anonymous information about your browsing habits. Links in our e-mail communications to recipients are tracked via web beacons once you visit the Website. Web beacons appear on the Website as 1x1 transparent images that transmit information such as your operating system, browser, resolution, geographical location, products ordered, and order total. This information is used to help our webmasters and marketers understand the behavior of visitors to the Website and the effectiveness of online and e-mail messages. Your information is submitted anonymously, and no personal information is transmitted. Furthermore, our computer servers automatically record information that your browser sends whenever you visit a website. These server logs may include information such as the date and time of your access to the Website, the length of time of your visit, the portions of the Website accessed, the number of times you visit and purchase from the Website, the IP address assigned to your computer, the type of browser used by your computer, the domain from which your connection to the Website originates, and one or more cookies that may uniquely identify your computer. We assign you a unique internal identifier to help keep track of your future visits. We use this information to gather aggregate demographic information about our visitors, and we use it to personalize the information you see on the Website and the e-mails you receive from us (should you grant us permission to send e-mails to you). We keep this information for our internal use; we do not share it with others. This information is in no way tied to your personal information, including your e-mail address. (iv) in compliance with subpoenas or other valid court orders, in response to inquiries and requests from regulatory authorities, in connection with the prevention or detection of fraud, or as otherwise permitted or required by law. In addition, we will make full use of all information acquired through the Website or otherwise that is not identifiable to you. Your personal information will be stored outside Canada, in Switzerland. Therefore, local tribunal and legislation will have jurisdiction with regards to the access to your personal information. Through your account at the Website, you may access your basic personal information in the possession of Christian Louboutin and correct inaccuracies of that information in our records. On written request and subject to proof of identity, you may also consult the personal information that we have disclosed, and ask that any necessary corrections be made, where applicable, as authorized or required by law. The Christian Louboutin takes reasonable measures to safeguard your personal information against unauthorized access, disclosure, copying, use or modification, whether or not in electronic format. We use industry-standard technological precautions in an effort to protect your personal information as you transmit it electronically from your computer to Website and, furthermore, to protect it from loss, misuse and unauthorized access, disclosure, alteration or destruction. 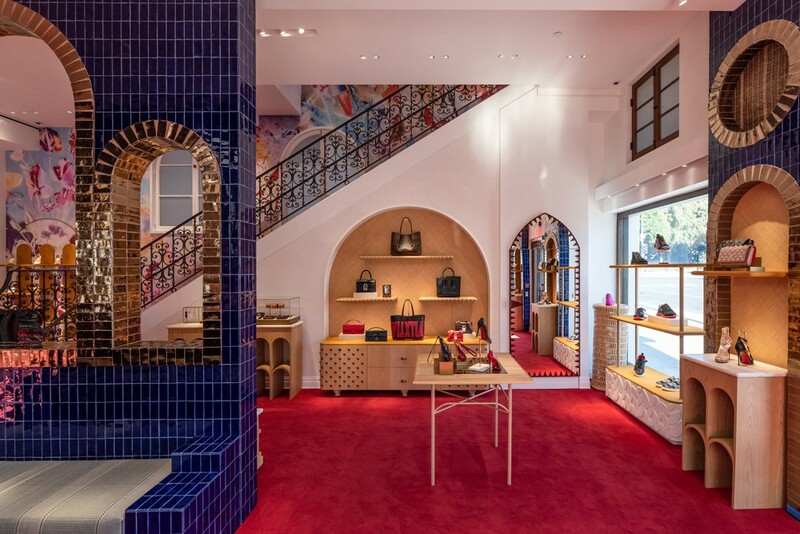 Furthermore, Christian Louboutin requires that employees and third-party administrators/processors access your personal information only on a “need-to-know” basis. You should keep in mind that no combination of security measures can ever provide guaranteed protection all the time. We caution you that e-mail may be particularly vulnerable to unauthorized interception, eavesdropping, modification and spoofing, and, therefore, you should take special care in deciding what information you send to us via e-mail. Moreover, where you use passwords, ID numbers or other special access features on the Website, it is your responsibility to safeguard them. The Website may contain links or references to third-party websites that are not affiliated with Christian Louboutin. The inclusion of any link does not imply Christian Louboutin’s endorsement of any other company, its websites, or its products and/or services. Any such linked websites have separate and independent privacy policies which we encourage you to read carefully. Please be aware that Christian Louboutin has no control over linked third-party websites and, therefore, no responsibility or liability for the manner in which the organizations that operate such websites may collect, disclose, use or otherwise treat your personal information. Your use of Website is subject to our Terms and Conditions of Use.